Bakers Rack – Mobile bun racks for catering and large events. Used to hold foods that are ready for service. Perfect for cooling and storing large amounts of cookies, pies, cakes and other pastry items. Use at full capacity or stagger your pans, this rack has great storage flexibility. Perfect for cooling with its open sided design. Back wheels lock for secure placement. 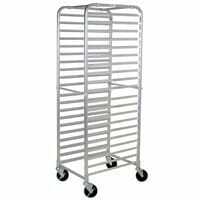 Smooth wheels make this rack easy to move and reposition as needed in your baking, storage or food service space. For an enclosed hot box click here.